Sleeps up to 20 in 8 bedrooms with 4 bathrooms. Weekends from £2,600 to £2,800, full weeks from £3,000 to £3,800. For shorter stays please enquire. If fully occupied, price per person per night is usually between £21 and £47. For relaxed, laid-back country wedding reception. Fill our Estate with your loved ones for your special day. Seats up to 50 indoors and the total venue capacity is 150. Pekes Manor was built in about 1470, and is a fine example of a good-size jettied Wealden Hall house, retaining many of its 15th and 16th Century features. 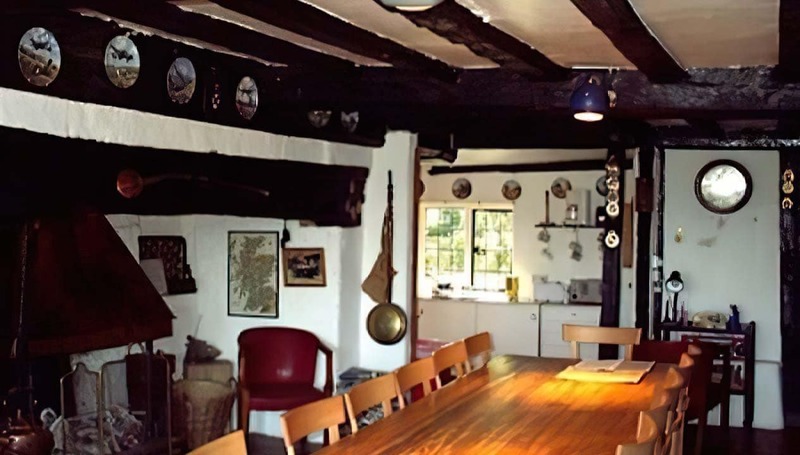 The large kitchen with its huge fireplace is largely as it was built in about 1550. The owner’s grandfather bought Pekes in 1908, and substantially refurbished and added to it, creating the basis for the comfortable house that exists today. Pekes Manor is a Tudor country house dating from 1470, and the estate has been owned by the same family for over a hundred years. The accommodation on the estate is flexible. 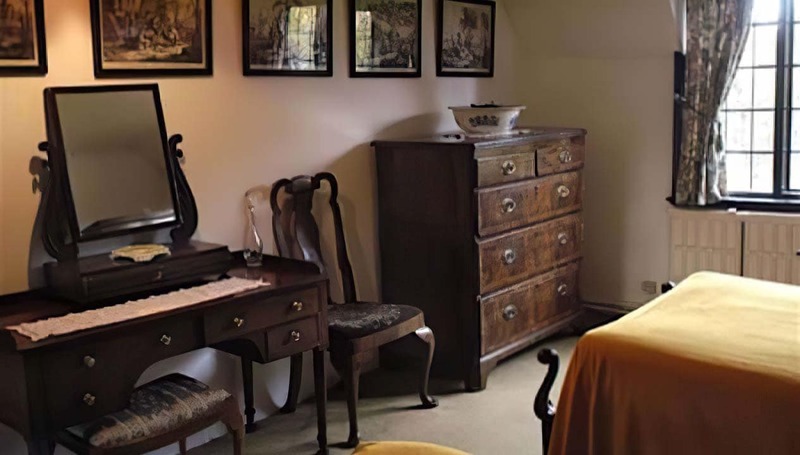 The Manor sleeps 20 in 8 bedrooms, although there are other properties on the estate allowing up to 62 guests (The Oast House 12, Mounts View 12, The Wing 6, Gate Cottage 5, Tudor View 7). The Manor House though, is the jewel in the estate’s crown. There are five bedrooms on the first floor and three on the second, which are known as the old nurseries. Downstairs, there’s a large living room with a television, and two kitchens. 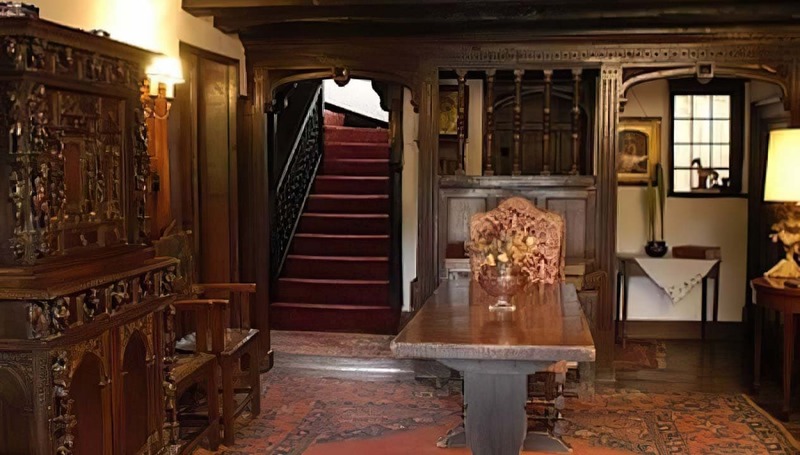 There is also an oak-paneled dining room (which can seat up to 26, should you have the urge for a fine banquet). The Pekes Estate has extensive gardens and parklands of 28 acres, which are shared by the guests of the other houses. Guests can buy vegetables from the well-stocked kitchen gardens, and fresh eggs from the Pekes’ hens. 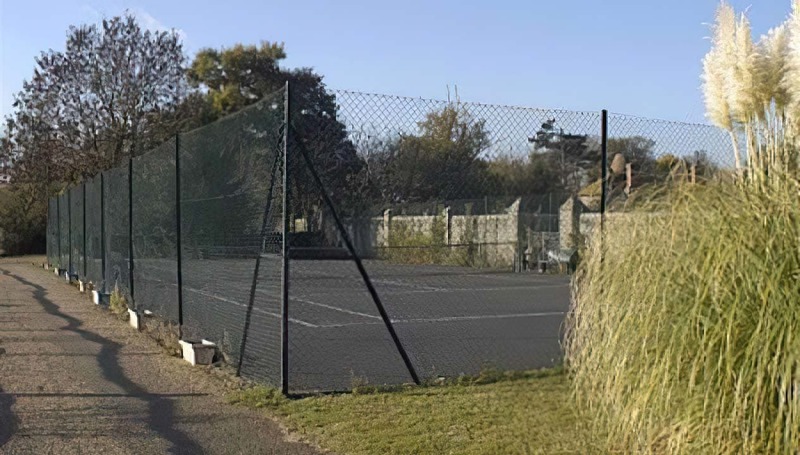 Should you be feeling energetic, there is anindoor heated swimming pool, sauna, jacuzzi, lawn badminton, hard Macadam style tennis court, and endless lawns for boules and croquet. The Pekes estate is in East Sussex, just above Eastbourne and about 20 miles (40 minutes drive) from Brighton. The house is 20 minutes’ drive from the beach at Pevensey Bay. The Pekes Estate is perfectly placed for lots to do. Not only is there the beach, but also many other places of interest to visit, like Battle House (Battle of Hastings), and other grand houses such asHerstmonceux andMichelham Priory (which has the longest moat in England). There are great treats for walkers and cyclists too, with The VanGuard Way, the Weald Way and a famous (mostly) non-road traffic trails, the South Downs Way. If you’d like a bit of nightlife, there are great local pubs, or there’s the delights of Brighton, with all of its distractions. Pekes Manor makes a great reception venue, and its gardens make beautiful backdrops (especially the giant topiary ducks). There are several local registry offices and churches nearby. You can invite up to 150 guests, 63 of whom can stay in various self-catered properties on the estate. Pekes Manor fulfilled all our expectations. An amazing experience not to be forgotten. Absolutely everything was thoughtfully provided - spacious historic surroundings inside and out, warmth, comfort and total relaxation. Great heated pool, playground and sauna beautifully kept. Wonderful views. Excellent pub 5 minutes away. In all a great place to enjoy with all the family. Can’t recommend Pekes Manor more highly. Thank you Kildare and his team. This is the second time we have had a large gathering a Pekes Manor and both experiences were fantastic. The main house manages to be both impressive and homely the same time. It's relaxed atmosphere makes for a really fun place to stay with family and friends. Many thanks again to Kildare and his team. Pekes is s special place in magical surroundings - the old world charm is everywhere and the dedicated team are among the most helpful and friendly you will find. A genuine warm welcome is a lovely start to any break....this was our experience at Pekes. We visited during the February half term in 2019 with our two daughters (9&10)...we had Spring like weather everyday and Pekes seemed even more beautiful. Since we last visited 4 years ago, many very noticeable changes have occurred....lots of investment in time, money and love is obvious. Our chosen rental property (Tudor View) is a warm and cosy dwelling that flanks the Tudor Manor House....there isn’t a bad view from any window!....the main bedroom has one of most impressive views available anywhere...seeing is believing! Daily swimming in the recently refurbished pool is a delight (very warm water these days) - the large jacuzzi is always hot and ready to use, there is a sauna for those who do. For us the gardens and surrounds are what make Pekes what it is. Historically preserved with lifetimes of work on display to all that care to wander.....and wander we did! The feeling of safely for children to play is priceless, we enjoyed many games of hide and seek (based on a TV show called ‘Hunted’) - GPS tracking the kids around the estate is great fun and a golden memory. The estate is also very enjoyable for couples and groups seeking a break away from the busy outside world. I have been visiting Pekes since the 1980’s and have always enjoyed the easy living - the 2 pubs are a joy and very different. You will be delighted with the food on offer and the olde worlde surroundings. So in summary I would easily recommend Pekes as a lovely break to spend a break away from the hustle and bustle of the busy world. Just go and relax........ — with Claire O'Keeffe . We’ve had the perfect New Year break here at The Gatekeepers Cottage. Two adults and three children. The cottage is so cosy and my son has loved reading all the children’s books doing puzzles and playing snakes and ladders. We’ve used the tennis courts and played football. Fed the ducks in the duck pond and visiting the chickens and hunted Gruffalo in the woods. The pool is excellent. A really good size and lots of fun. The hot tub is an added bonus. We will definitely be back to visit in the summer. Spent Christmas here this year and all I can say it was amazing! Such a lovely house, highly recommend this to anyone thats looking for a quite get away with family and friends. Nice long walks, great to take the dogs! Definitely would come back here again! Can’t explain the feeling it gives until you go there yourself. My daughter celebrated her 50th birthday in this beautiful old house! It was a surprise weekend booked by her husband! We were 11 adults and 8 children, age range being 6-83. We had the most wonderful time! An old house but modernised without spoiling the original features in lovely grounds and with walks nearby. Two kitchens with all the equipment we could possibly need. Comfortable beds, all made with fresh white bedding. Very inviting! We lit the log fire one evening, which added to the atmosphere. Plenty for us all to do! Tennis, croquet, etc. 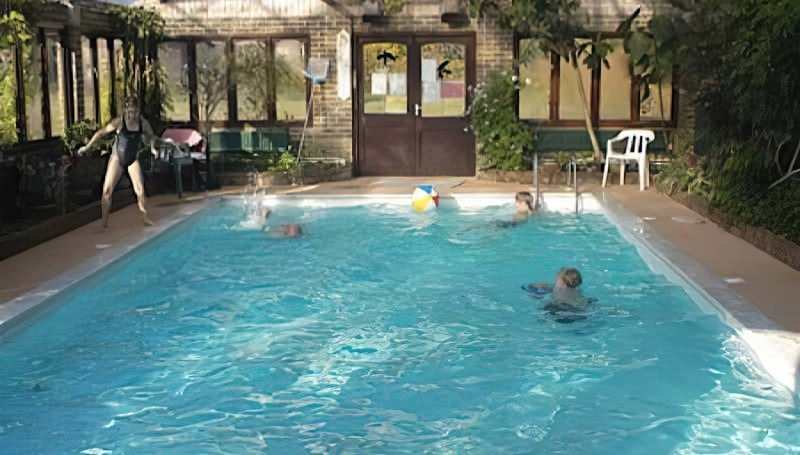 and a lovely heated indoor swimming pool, which the 8 children especially enjoyed! I would definitely recommend this house for a special event. Plenty of room for our party of 19! One of the best times we've had together as a family! Everyone enjoyed everything! A group of 18 of us stayed in Pekes Manor for our 10 year university reunion. The manor, garden and games room were fantastic and we used all the facilities (including the swimming pool and jacuzzi) throughout the weekend. We loved exploring the house (which is a bit maze like but was great fun to look around!) and found that everywhere was perfectly clean, the beds were comfortable and the heating and aga made the house really cosy for our stay. Kildare made booking Pekes incredibly easy, and was so helpful in answering all of our questions. We also met other members of the team (including Jilly) who were very helpful on arrival and throughout the weekend. We had a fantastic time and would 100% recommend. We booked Pekes manor and some of its surrounding cottages for our wedding this late September, and enjoyed it for a whole weekend. The place is beautiful, outside and inside, clean, well maintained, with spa facilities for adults and a playground for kids, we couldn't have asked for more! The communication with the owners was so easy and they made every effort to ensure we have all our needs met. We couldn't recommend this place enough, hopefully we will come back one day to celebrate our anniversary there. This place is a real find. Stayed with my brother and our four respective young children in the Edwardian wing during February half-term. Lovely old period feel to the accommodation, and great grounds for the children to play in, complete with games room, steam room. hot tubs and a beautiful heated indoor swimming pool in its own conservatory. The house is also in a pretty remote area, so you feel like you're properly in the countryside (some rural areas of Kent still a feel a bit "commuter belt" in my opinion.). Overall, a great rural bolthole, especially if you want somewhere handy close to London. We loved our weekend 40th birthday celebrations. The house is brilliantly charming complete with a Cat.... and lots of amenities make for a fun packed weekend. Wish we had longer to enjoy it all. We have just had a superb experience of staying at Pekes Manor for the weekend, celebrating my partner's 60th birthday. We had 50 guests and took over the whole site. The grounds are spectacular, and include a beautiful indoor swimming pool surrounded by plants, two hot tubs, one with a lovely view across fields. The Manor itself manages to be both grand and full of Tudor history while at the same time being warm and friendly, with open fireplaces and lots of different rooms to cozy up in. I can't recommend this place enough. Amazing place, had a really lovely stay. A truly wonderful place. Lovely food cooked by local chef. The whole experience was lovely. Will definitely be booking again. Fabulous setting, unique houses and great value for money. The owners are friendly and laid back and the grounds are stunning. Recommended! We have been coming to Pekes Manor with our dogs since 2009. We absolutely love the whole place, the setting is beautiful and has a magical charm and peace which is hard to describe without feeling it for yourself. We have stayed in three of the holiday properties now and they all have their own unique atmosphere. A very special place. I arrived at Pekes Manor as the sun started to set at 4pm. The house is situated in rural East Sussex and is the largest of a collection that form the Pekes estate. Dating back from 1550 it has stood the test of time extremely well and has an astonishing collection of rooms that feel steeped in history. 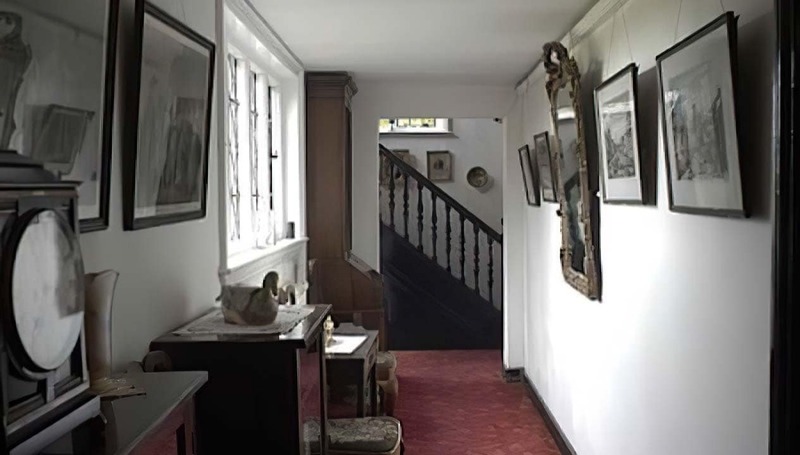 In my opinion what makes the house so special is that, rather that being gutted and re-furnished, much of the interior is original and there for visitors to enjoy. It has not been 'sanitised' for rental and there is a wonderful atmosphere. The dining room can seat all 18 guests and the kitchen/scullery with Aga can easily cater for them all. The house's Achilles' heel is a lack of sitting room space (the room is only small) but as long as you're happy to sit around in the kitchen or dining room that should not be a problem. Upstairs the bedrooms are charming and comfortable. All are of a size fitting to the house, large enough to be airy but not vast. The modern-day bathroom was not around in the 1550s so all have had to be added more recently and, as with most houses, they number less than the bedrooms. From the website; There are 8 double bedrooms and 4 bathrooms (2 with bath, WC and basin, 2 with modern shower, WC and basin). The facilities include all that you could ask for, indoor pool, jacuzzi, sauna, tennis court and badminton lawn. They are shared with the other five properties on the estate though can be booked for exclusive use on an hourly basis. Privacy is reasonable and plenty for a family gathering or birthday party (though perhaps not an 18th!) - given how many repeat bookings are received previous visitors must be very happy. The location is also superb; Landed Houses' closest property to London yet still with a rural feel. Pekes Manor itself sleeps 18 and with all the additional properties 50 can be accommodated - a great collection.